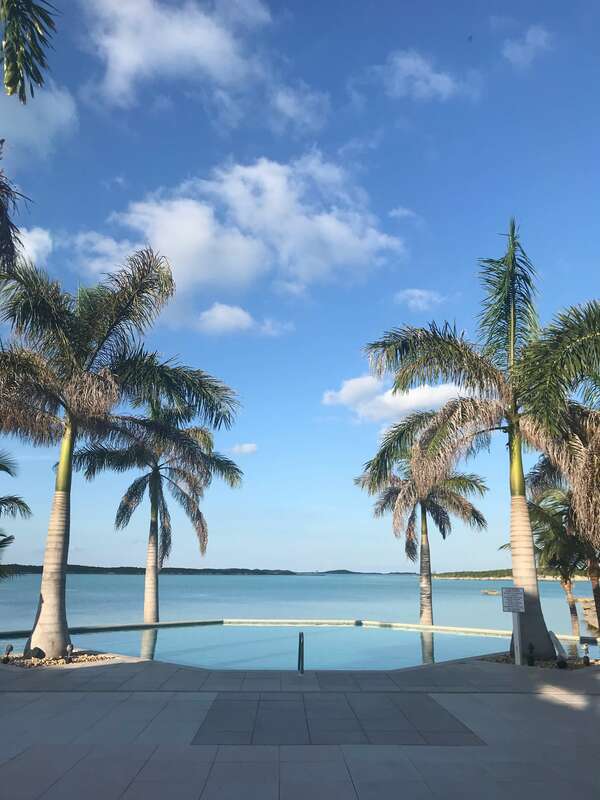 Exuma Travel Guide – The Best Things to do in The Exumas! A couple weeks ago I had the opportunity to travel somewhere I had never had the chance to go before – The Exumas! I was so excited to see this piece of the world that I had never stepped foot on before, and it ended up being a trip I will never forget. 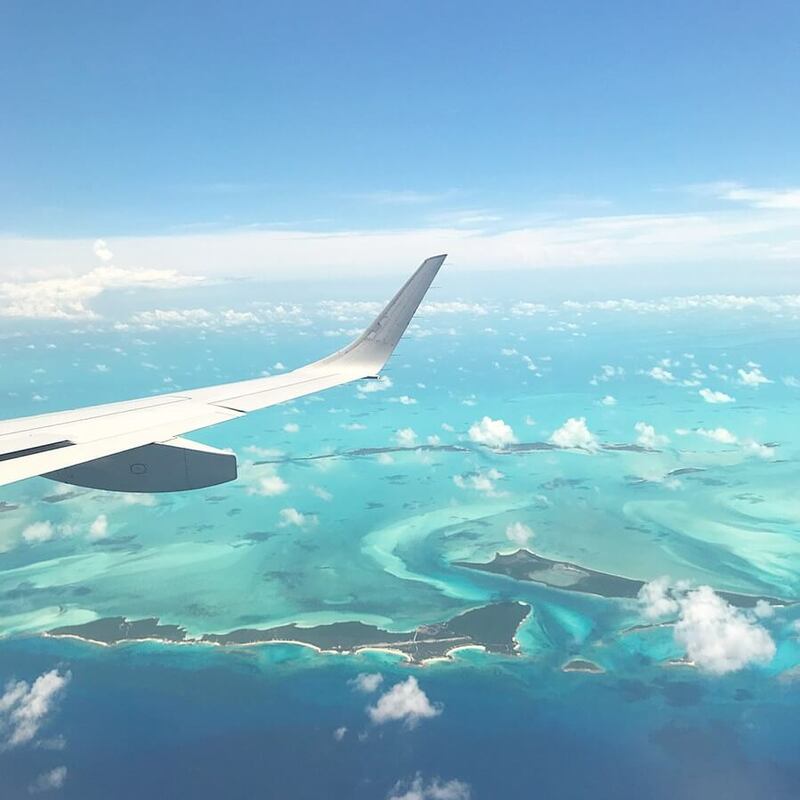 I traveled on a press trip with Air Canada Vacations and the Bahamas Ministry of Tourism, and I had the chance to do things that had always been on my bucket list that I wasn’t sure I would EVER do! I want to tell you everything – all about where I stayed, what I ate, what excursions I would do again in a second, if the trip was child-friendly, and so more! Before I get into the details, check out the video of my trip and I’ll catch you on the other side! First off, let’s talk about how I got there. 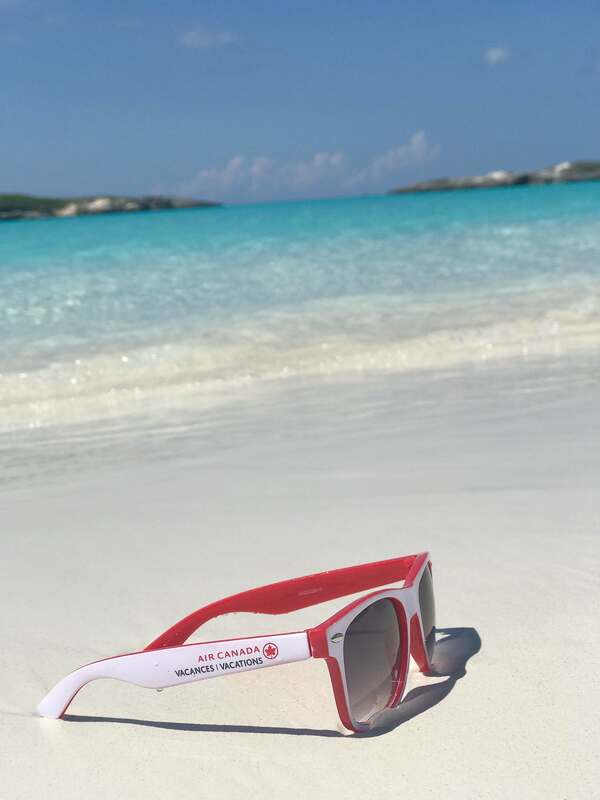 Air Canada is actually the only airline that flies directly to Great Exuma from Canada! There is a flight running once a week from Toronto Pearson Airport every Sunday, and hopefully we will see more flights each week from them soon! 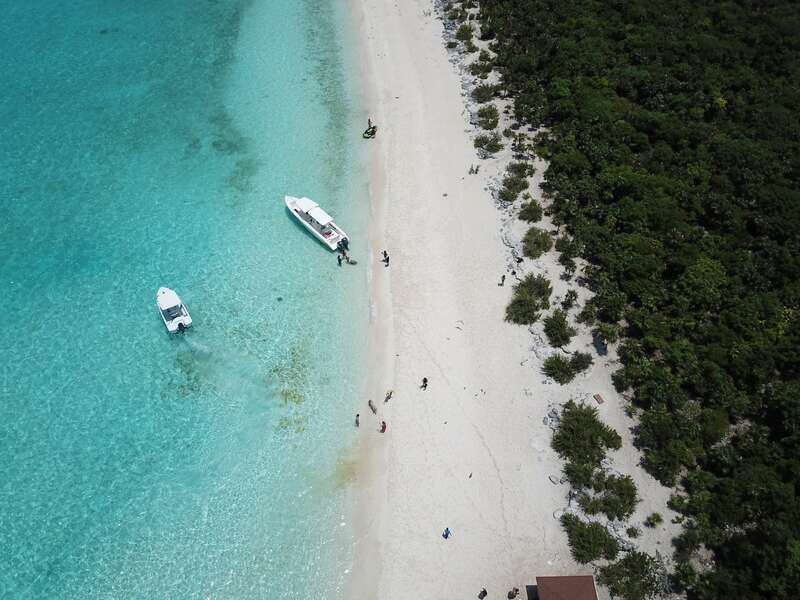 Air Canada Vacations offers the opportunity to not only book a flight directly to Great Exuma, but also accommodations, and excursions to ensure you get the full Exuma experience. 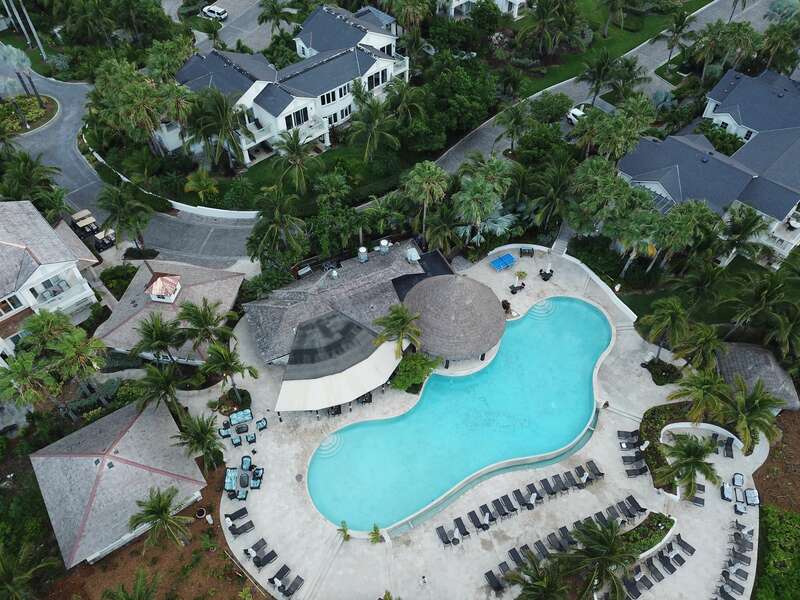 Air Canada Vacations has 5 hotel parents on Great Exuma including Grand Isle Resort & Spa, Sandals Emerald Bay, Hideaways at Palm Bay Beach Club, Augusta Bay, and Peace & Plenty. 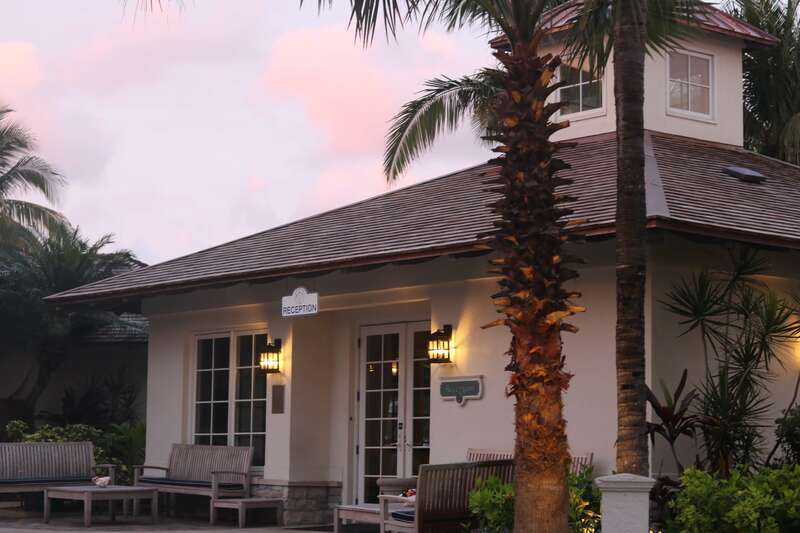 As for where I stayed I would personally refer to it as paradise, but the resorts actual name is the Grand Isle Resort & Spa. 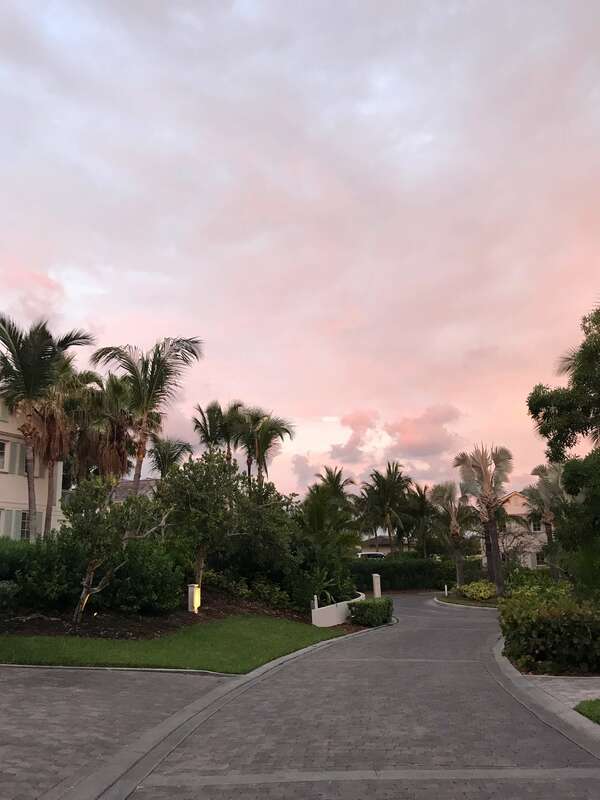 The resort was only minutes from the airport, and after entering the gates of this resort I was surrounded by beautiful villas and pretty palm trees! After a tropical welcome drink and quick check in we were shown to our villa for our stay. My villa had two levels, three bedrooms, three bathrooms and a HUGE living and dining area with a kitchen more beautiful then my own at home! There was a balcony off the ground floor, and also off the living area and the dining area. 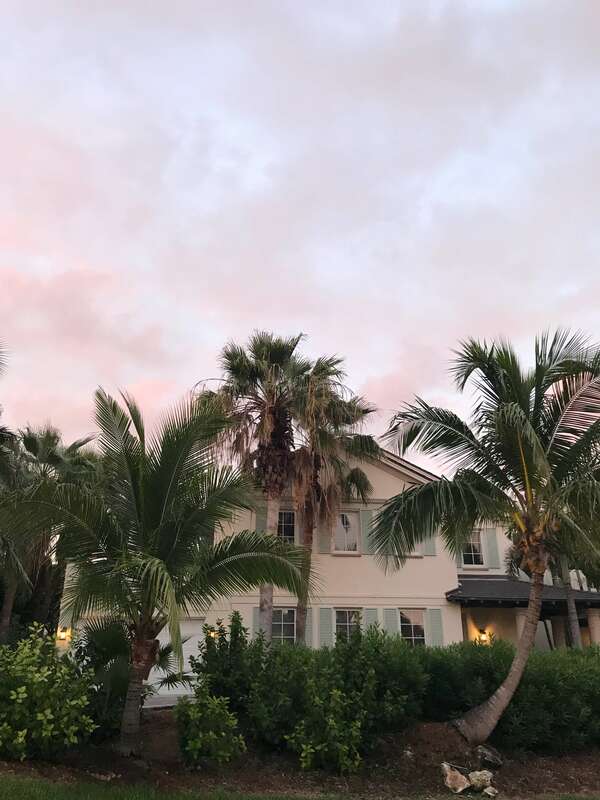 This spacious villa had more than enough room for one person looking for a week of relaxation, a couple looking for a romantic getaway, or a family looking for a week of fun! 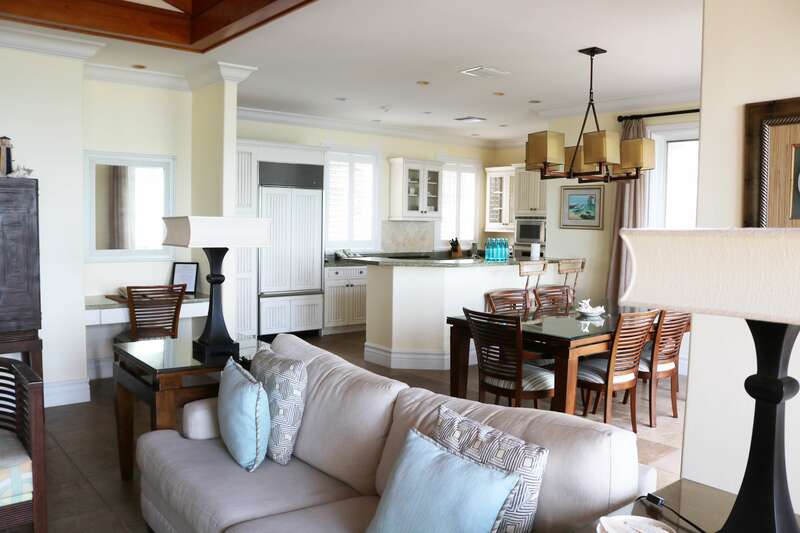 Each villa had one, two, three or even four bedrooms – perfect for families who want to vacation together but still have their own personal space. Everything was finished beautifully from top to bottom, tastefully decorated, and a huge plus was the closet space – normally on vacation I’m desperate for more hangers and closet space but my room had his-and-her closets! 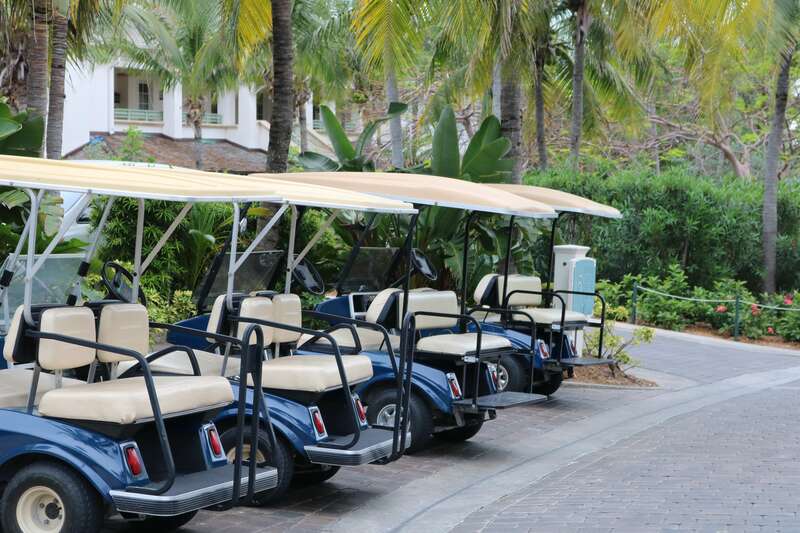 Each villa also came with a golf cart in it’s garage that could be rented for $20 per day – this was so cool. I couldn’t wait to drive mine around the resort! The resort allows you to pre-order grocieries before you arrive so when you check into your villa they are already in your fridge. The fee for this delivery service is $60 plus the cost of the groceries. You just need to email your shopping list 72 hours prior to your arrival and voila – they appear in your villa! 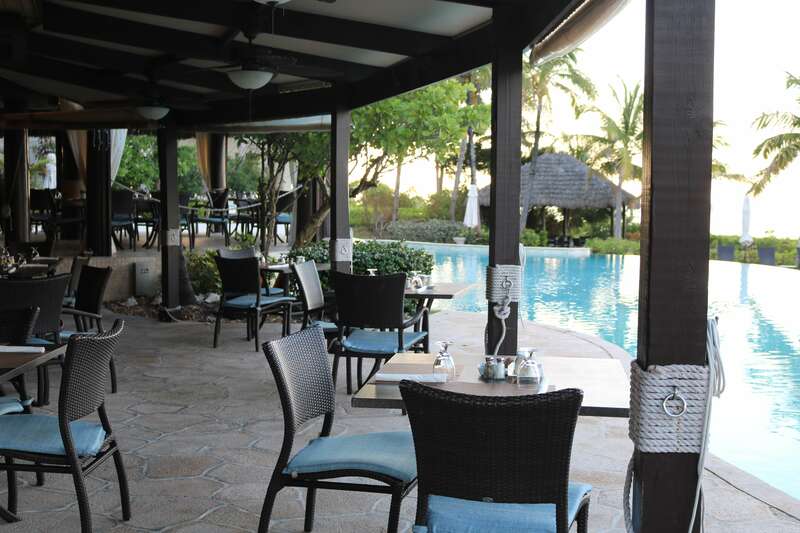 At the heart of the resort you could find Palapa Grill which served breakfast, lunch and dinner open to the pool with an ocean view. I had an amazing lobster fettuccine alfredo there which was incredible! 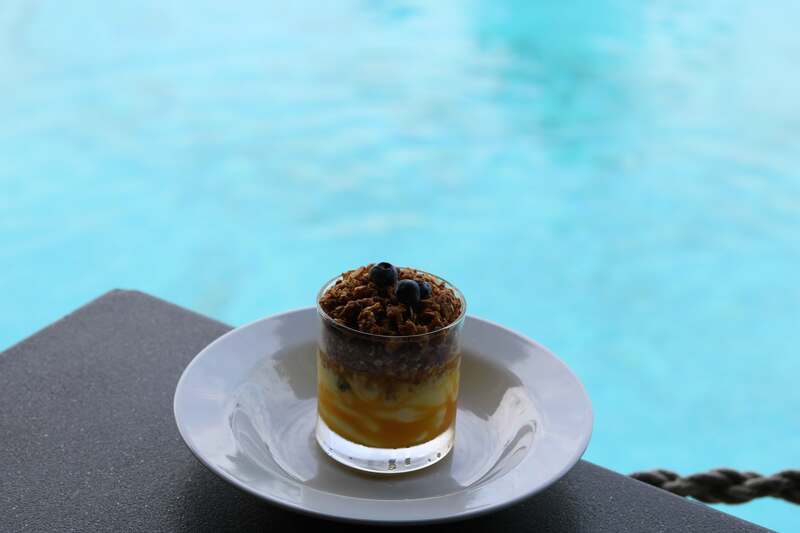 Also while there I had fresh grilled grouper, and a morning yogurt with fresh fruit and home-made granola – everything I ate there was perfect. 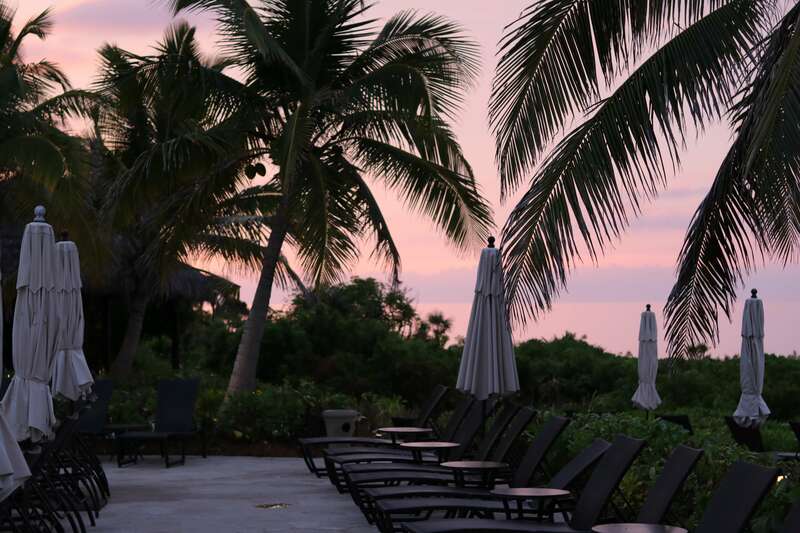 The resort currently has one infinity pool, but soon they will be opening two more pools, and more dining options. 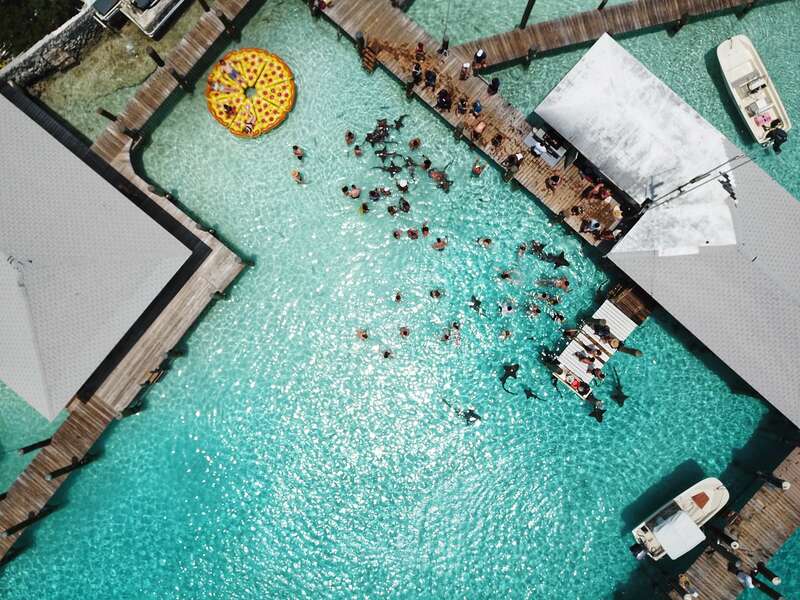 I didn’t feel the pool was overcrowded at any point during my stay, plus the ocean is only steps away so it didn’t bother me that there was only one pool. The resort is right on the ocean, and when I mentioned staying in paradise I had this beach in mind. 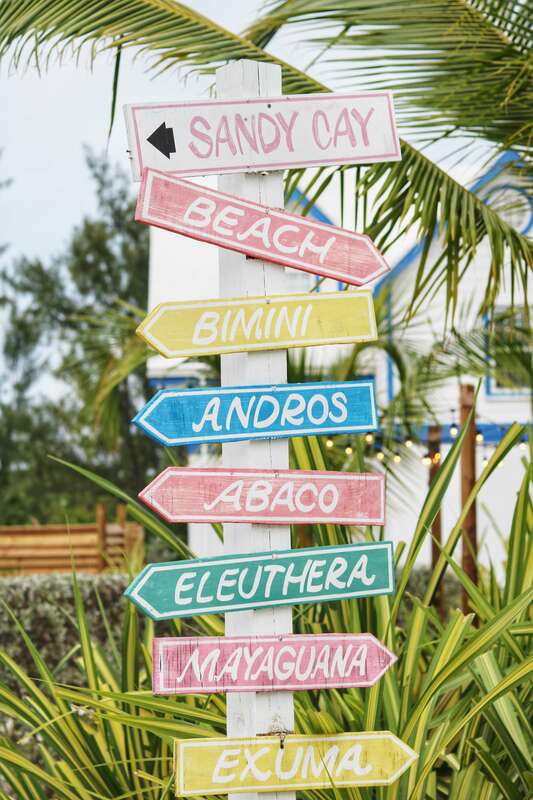 It wasn’t the kind of beach you find at most resorts with people trying to get you to ride a Sea-Doo or selling you necklaces while you try to catch a nap on the beach. It was quiet, secluded, and the water was calm. Stretching to the other side of the beach could see another resort in the distance, and I did try walking to that side of the beach and took a good 5 minutes to get there. 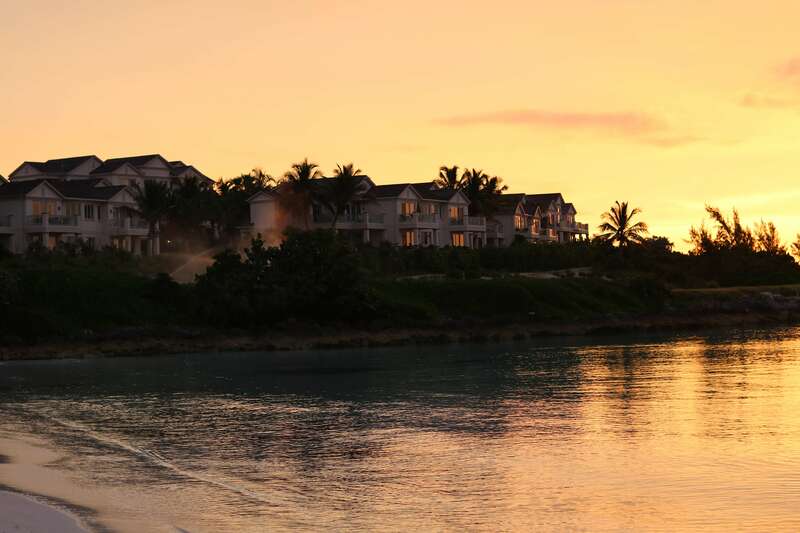 The beach at Grand Isle Resort & Spa is just for their own guests so you won’t find overcrowding of any kind! As always, I was thinking about bringing my son to this resort and how it would work for us as a family. 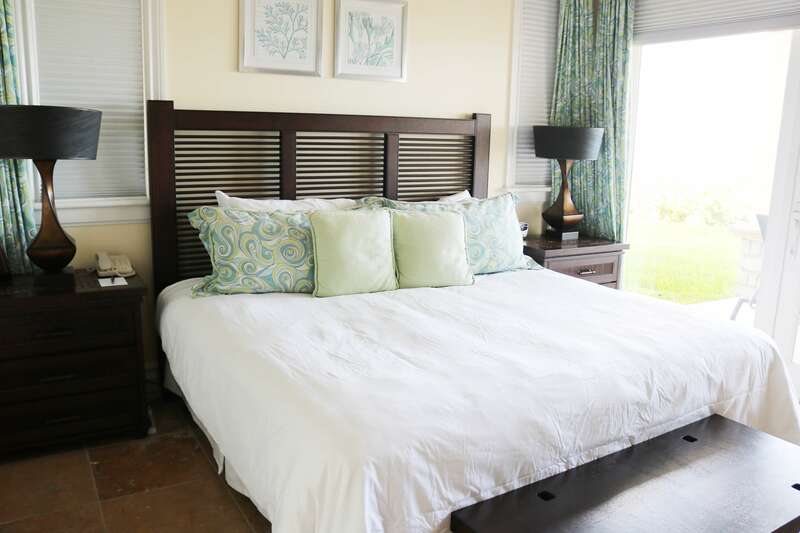 The villa arrangements would be perfect for a family with children – a separate room could also come with twin beds if requested, and there was so much space to stretch out and move around that the villas were the perfect way to relax and stay with family. 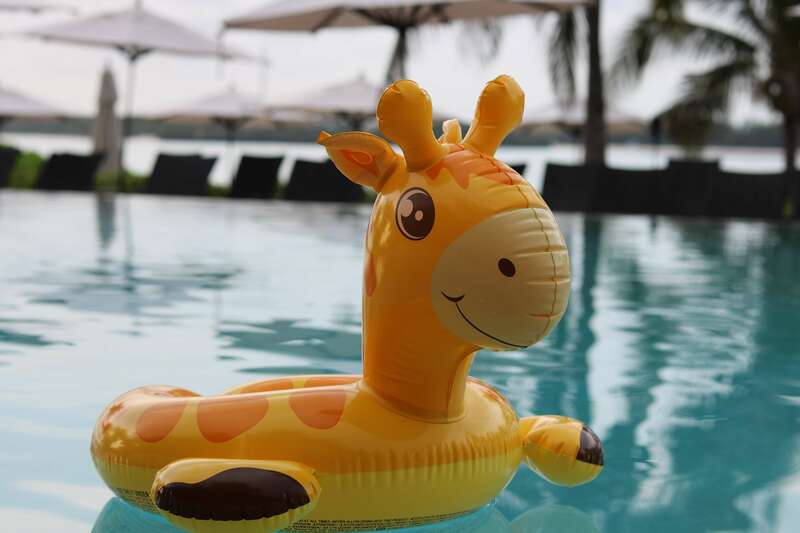 As I mentioned the ocean was calm on the Grand Isle beach so swimming would be easy to imagine with children, and I saw lots of kids playing in the pool with fun floaties the resort provided. 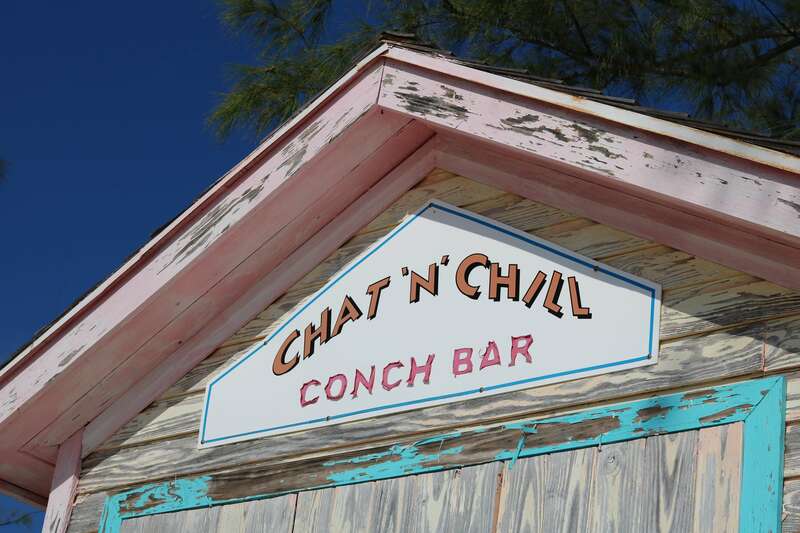 When it came to excursions while in Exuma, there were a few I had been dying to try! I honestly didn’t know if I would ever get the chance to do them, but luckily I had the chance to do everything I had always wanted to do and more! Let’s talk about the pigs first. 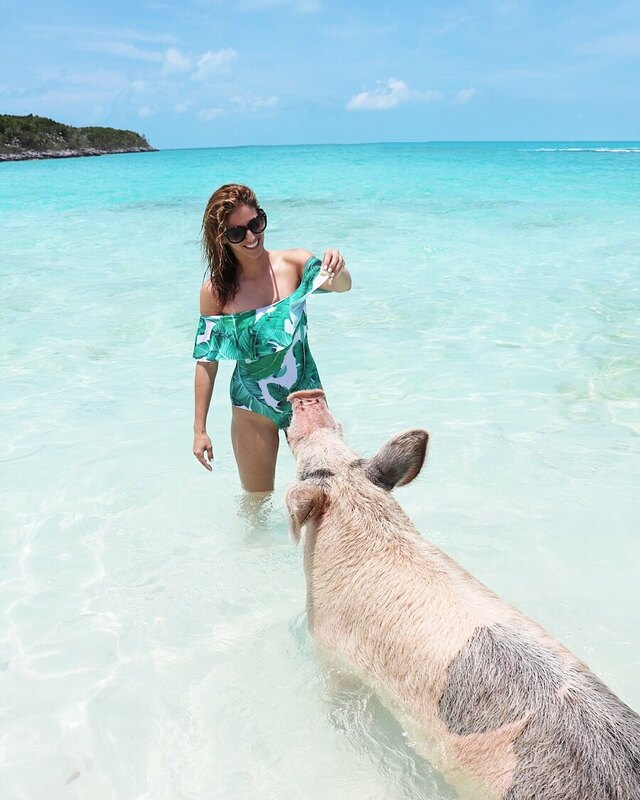 Swimming with the pigs was absolutely on my bucket list, and it was everything I imagined it to be. 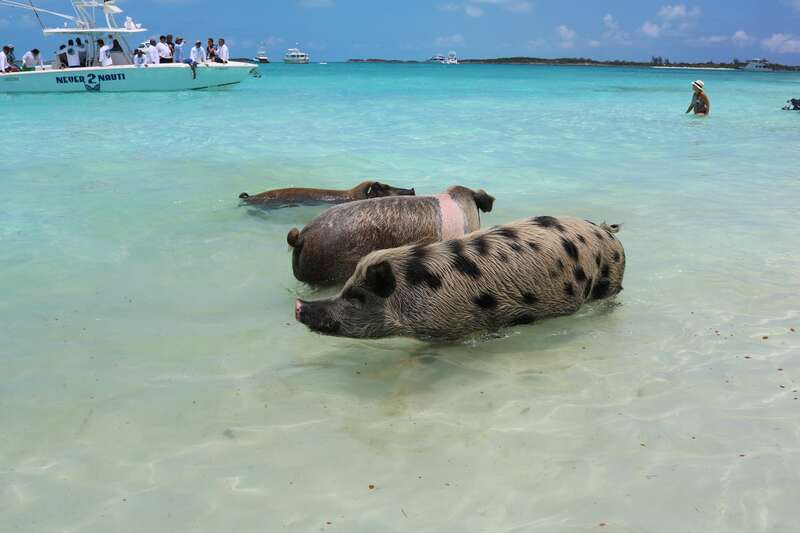 As soon as we approached Big Major Cay I heard squealing, and I’m not totally sure if it was me or the pigs! It was such an incredible thing to move slowly to this pretty island in the middle of the ocean to see pigs roaming the beach. 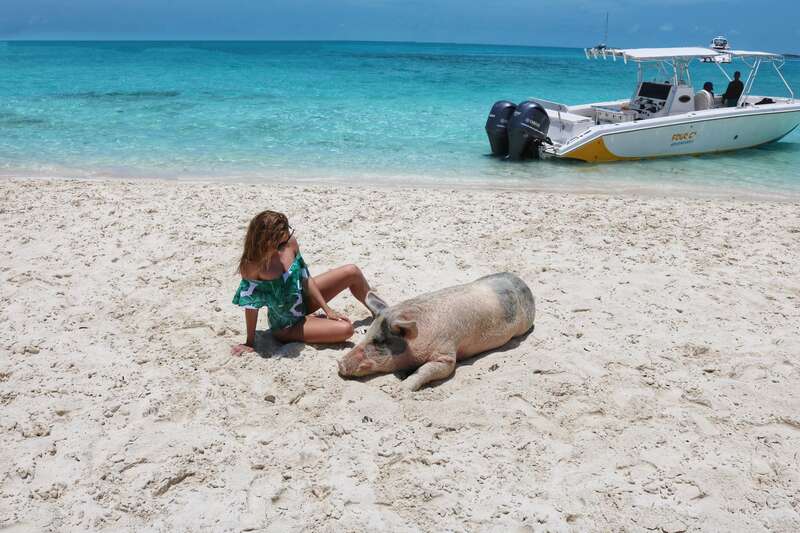 As soon as I hopped off the boat a pig snorted his way right up to me, and I couldn’t stop laughing! There was a feisty pig we were warned about who liked trying to nip at you were heard, but otherwise the rest were friendly and looking for a snack! A few did try to rush people out of the bushes looking to change, but they were all otherwise friendly creatures looking for some love from us. 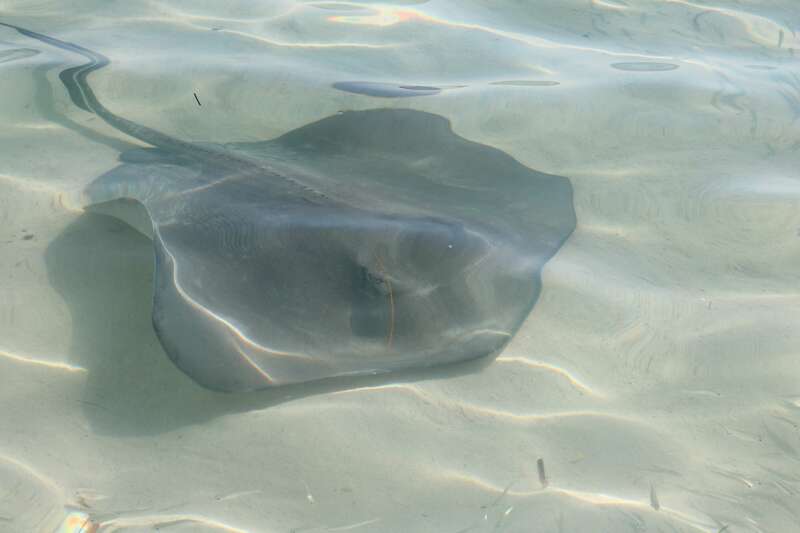 I could have stayed there even longer – they swam with us, let us pet them, and one even plopped down on the beach right beside me for a belly rub! I really wish my son had of been there for this – he would have loved this! 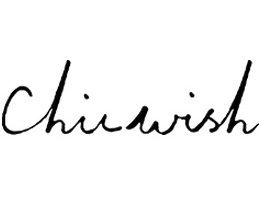 Any child would love every second of this experience! 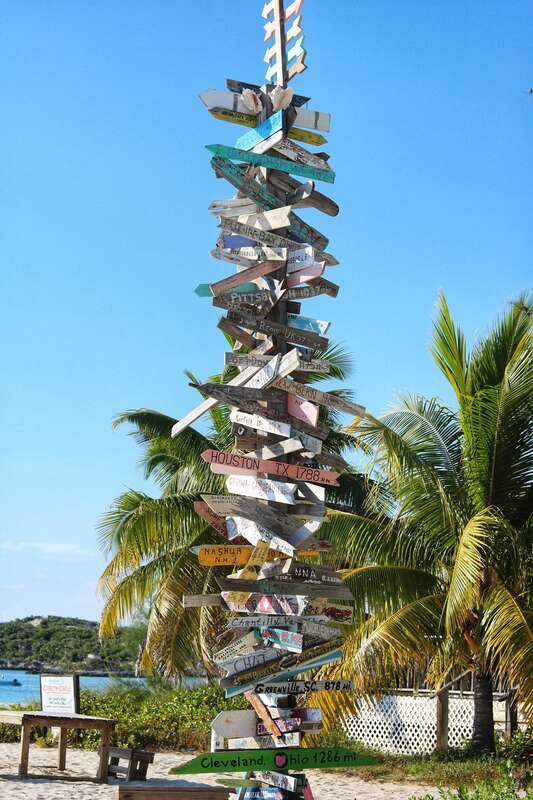 We toured the islands (there are 365 in The Exumas in total!) and spotted some celebrity homes from David Copperfield and Faith Hill/Tim McGraw. 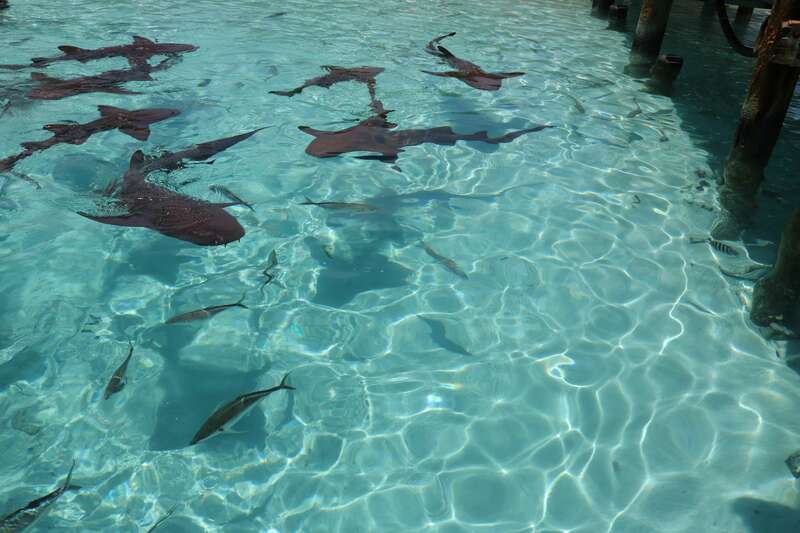 We stopped to feed the sharks at Compass Cay, and at first I was hesitant to get in, but once I did I’m so glad I went for it! They felt a little like sandpaper sometimes, and sometimes they were very smooth, but each time one rubbed past me it was a rush! It was a really cool experience that I never thought I would ever try. 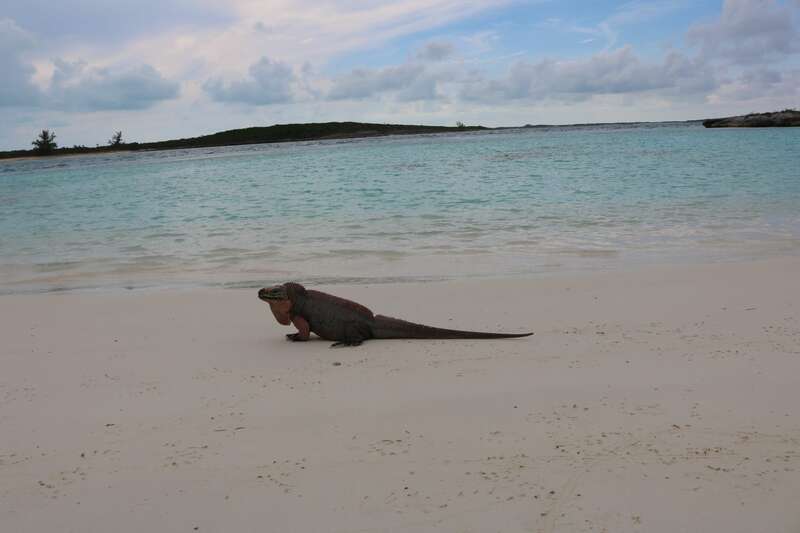 One island we stopped on that I never would have thought to explore was White Cay or what I call Iguana Island. Again I couldn’t help but laugh when I saw this island full of iguanas watching us arrive. 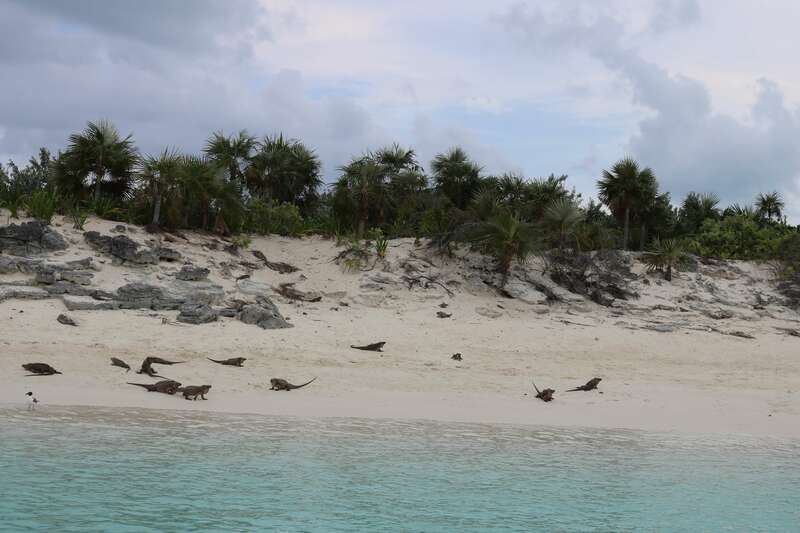 Fun fact – Nicholas Cage owns this island! They were friendly, curious, and again looking for a snack. I enjoyed this more than I thought it would – they were so neat to see up close! I’m sure my son would have thought they were little dinosaurs! A stop at Thunderball Grotto was one that most tourists would never miss, but as a weak swimmer I was worried about it. I decided to go for it since this was a once-in-a-lifetime chance to swim in this grotto, and it ended up being one of the best parts of the day. I watched a toddler swim out of the grotto so I knew that my fears were unfounded, and I’m sure my own toddler would have gone for it as well! At the right time with the tide we swam into the entrance and were treated to an incredible cave we could snorkel in. 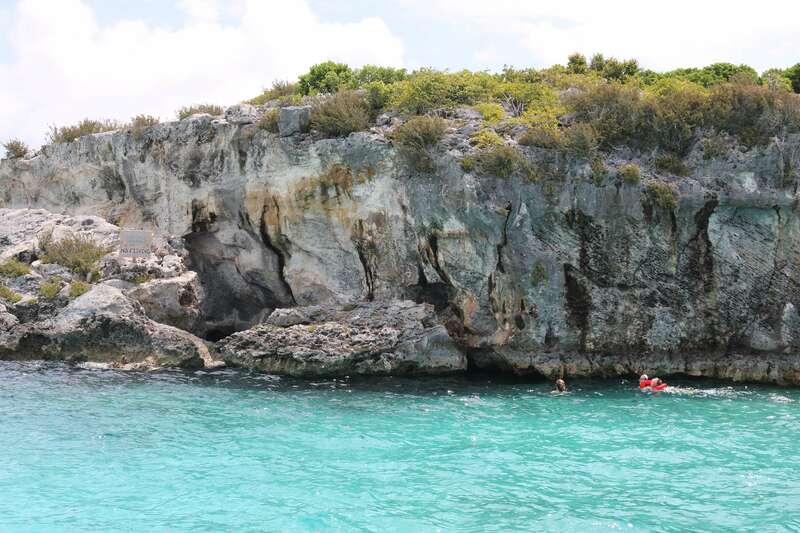 We spotted the most beautiful fish and coral, and swimming in and out of the grotto so for me it was exhilarating! It was used in scenes from James Bond’s Thunderball and Never Say Never Again which is a pretty cool fun fact! The whole day was full of some of the most amazing things I’ve done on a trip, so it’s a tour that’s not to be missed while in The Exumas! 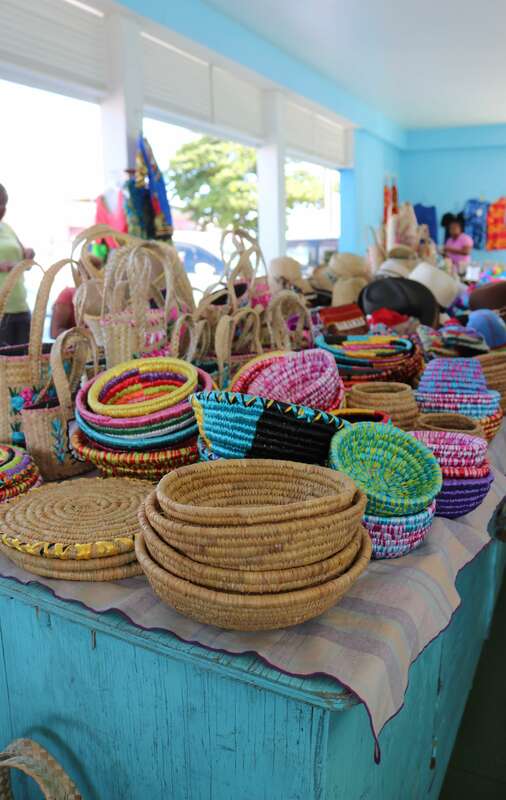 We spent another day on the east side of the Island which included some time at The Straw Market in George Town where I took advantage of the chance to shop for a few things I couldn’t find at home! 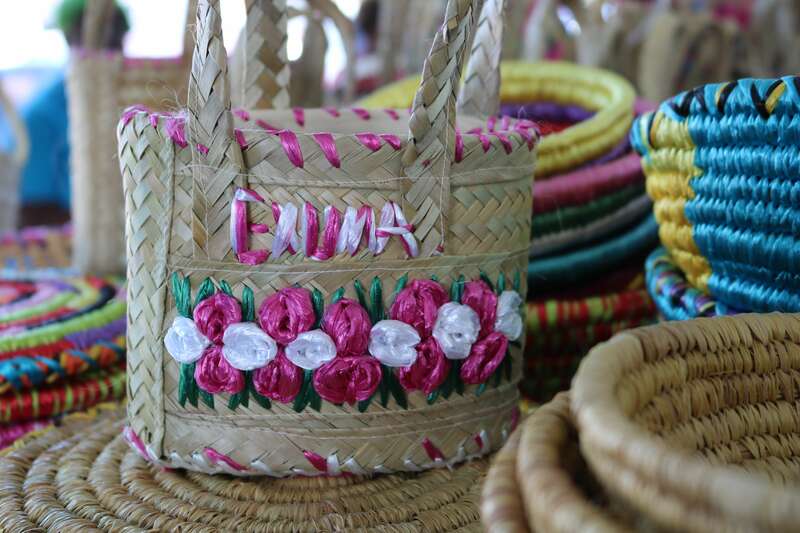 I left with a few souvenirs including the perfect little straw bag! We took some time to explore the most beautiful beach I have ever been on – the Tropic of Cancer Beach. I would consider myself well travelled after being to so many countries now, but I have to say without a doubt this was the most incredible beach I have ever been on. The water didn’t look real it was so calm and colourful, and the sand was so soft – it’s hard to describe just how amazing this beach was. 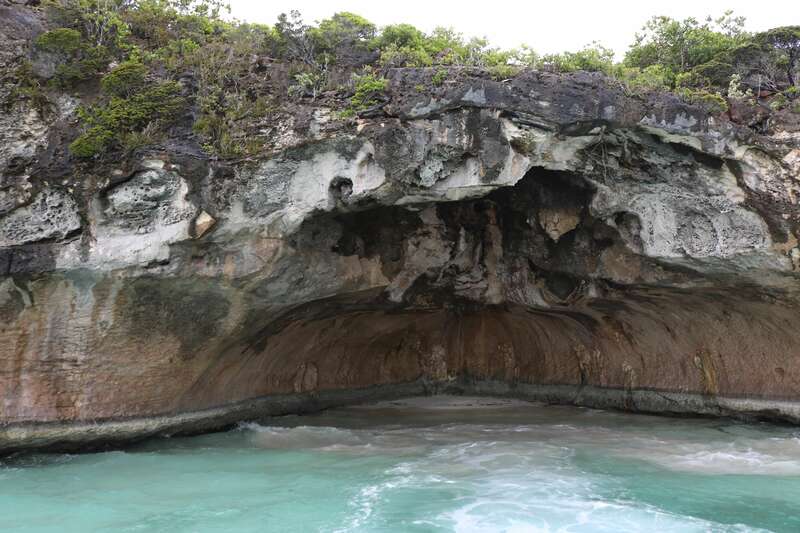 It was another one of those moments on this trip where I couldn’t believe what I was seeing and experiencing – this is a must-visit in The Exumas! 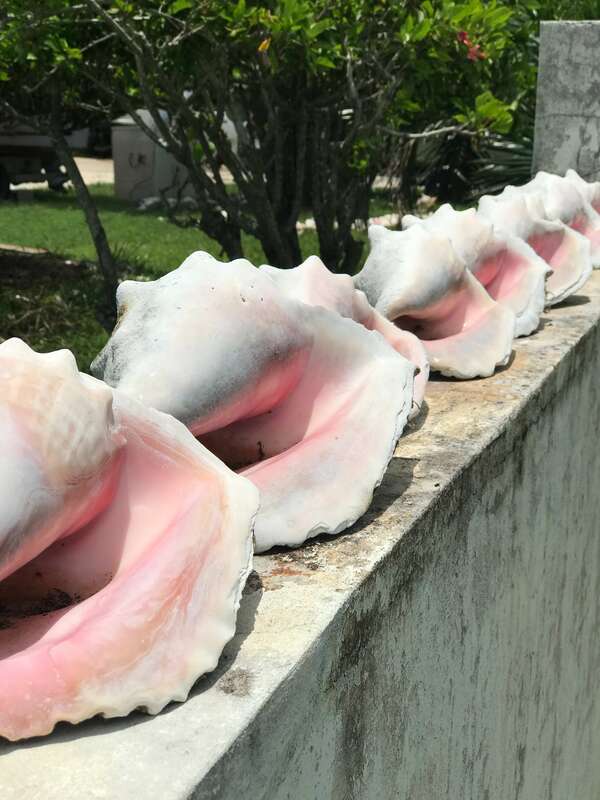 We took a boat from Elizabeth Harbour over to Stocking Island to Chat N’ Chill to pet the stingrays and have a fresh conch salad made for us. Stocking Island was a dreamy spot where boats were moored all around the calm waters, and visitors were lazing in hammocks. Another idillic spot where it felt like you were miles away from civilization. The Chat N’ Chill was quite an experience! 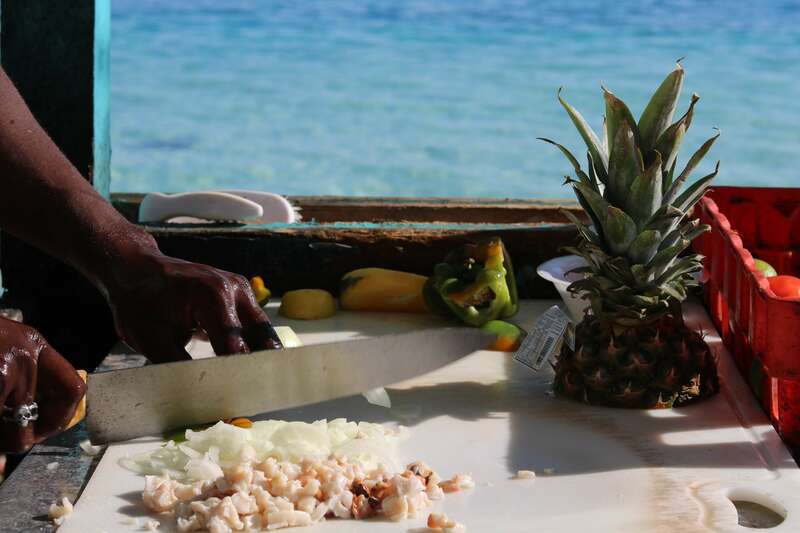 We watched as our chef grabbed the conch straight from the ocean, and created a salad with fruits and vegetables that couldn’t be fresher. What an amazing thing to see and eat! 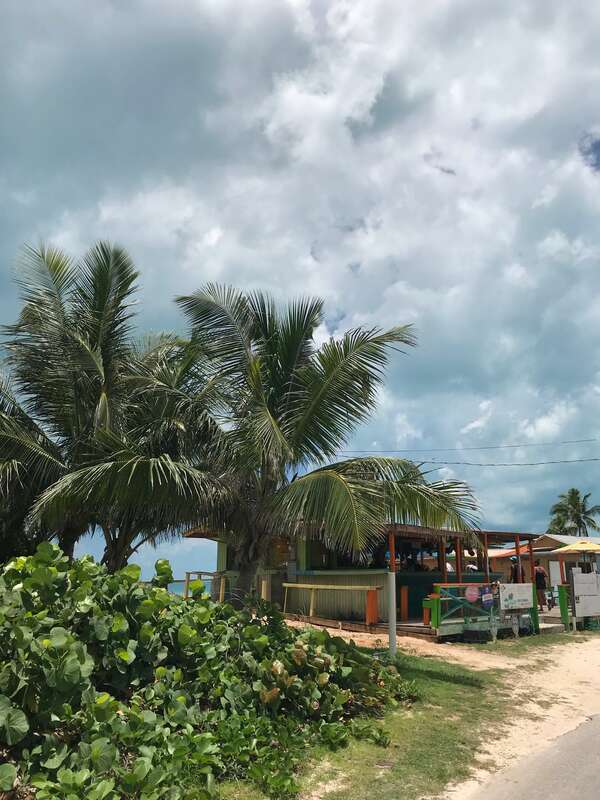 The experiences on the island were ones that I hadn’t had the chance to try on other vacations I have had – I did things that ranged from very adventurous like snorkelling in Thunderball Grotto, to more relaxed like petting the stingrays and having a fresh conch salad. 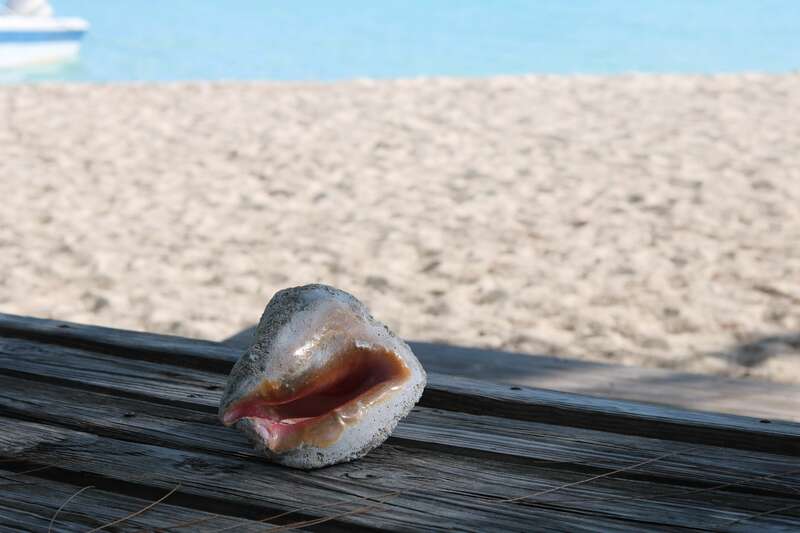 Wow, I ATE while in The Exumas! 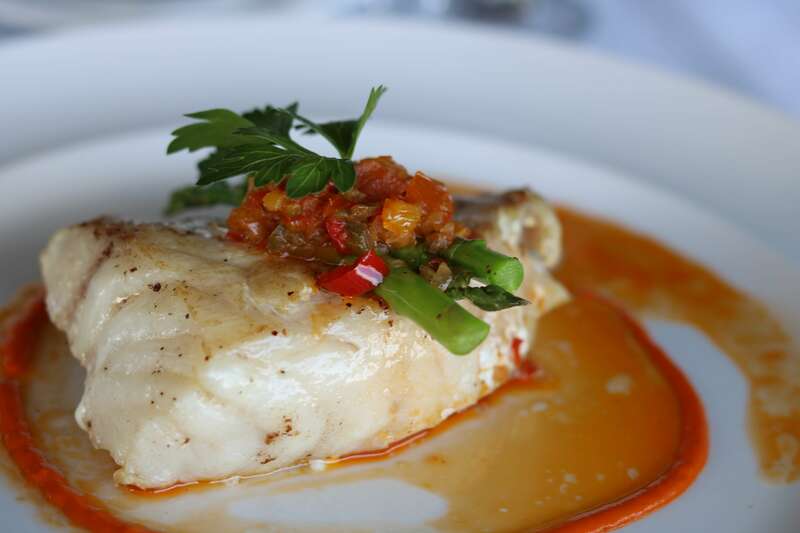 Right off the bat our welcome to the Grand Isle Resort & Spa I had my first ever taste of grouper, and I had grouper a few more times while I was on my trip! 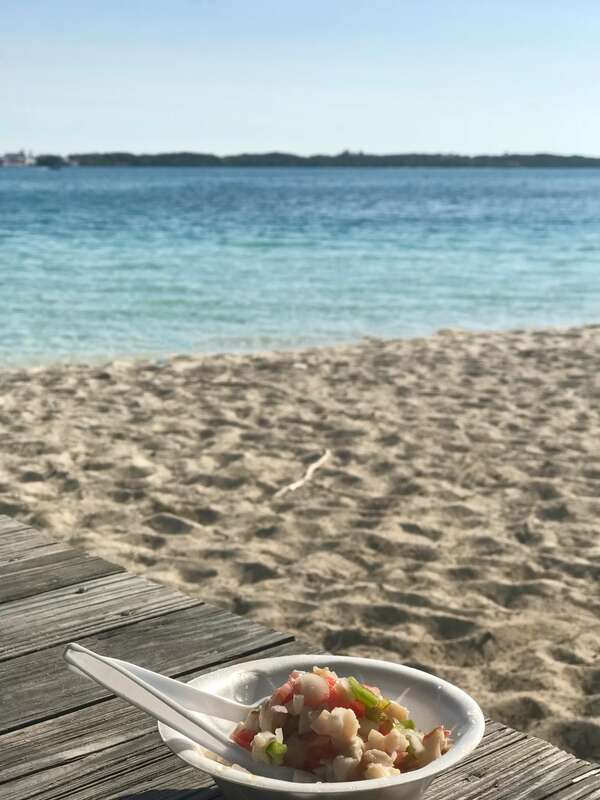 The Palapa Grill included fresh seafood often in their menu choices, and I enjoyed every bite! If you weren’t a seafood fan they had plenty of other options, but I was impressed with their versatile menu. 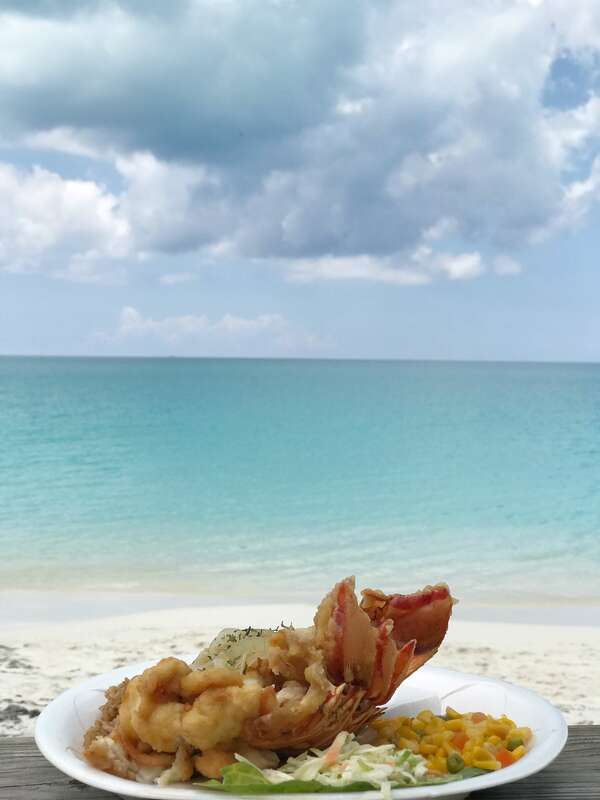 Once a week the resort hosts a Bahamian Dinner Night, and also an Island BBQ & Junkanoo Bonfire on the beach. I already mentioned that incredibly fresh (it doesn’t get any fresher!) conch salad a the Chat N’ Chill, but we also had the chance to sample other foods across The Exumas. 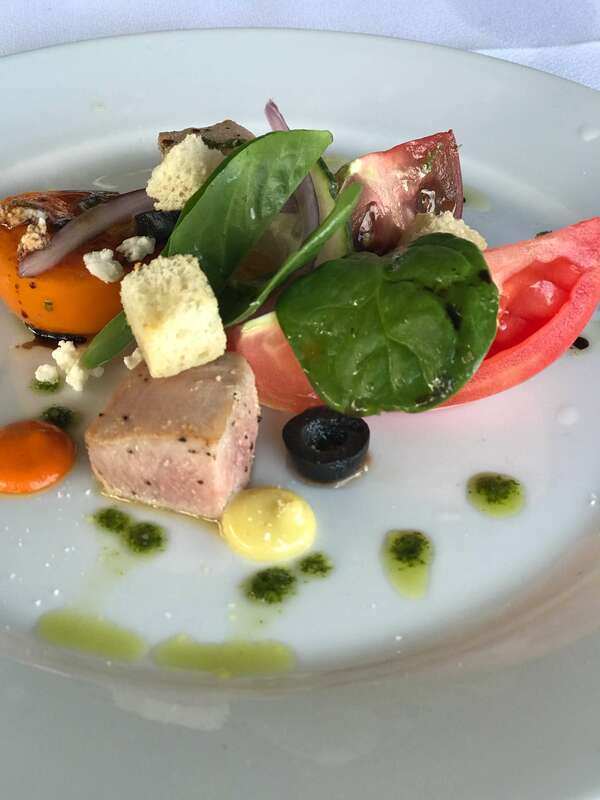 Our dinner at the Rusty Anchor Restaurant at February Point Estates was an incredibly relaxed experience. The view was just incredible, and the restaurant was beautiful and open to the ocean. 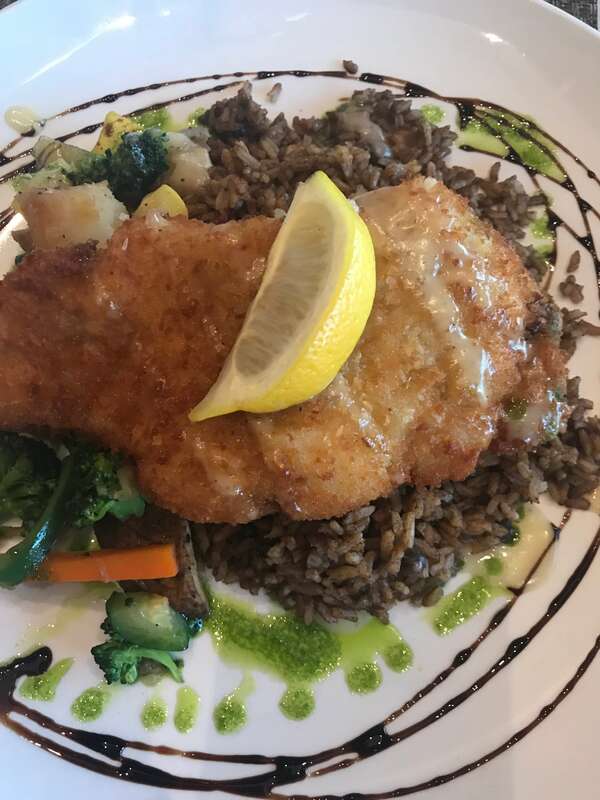 They made fabulous Pina Colada’s, and I tried their coconut crusted Grouper. It was massive – I could have shared it with another person in our group and even then we still may not have finished. The portions were huge, and so flavourful! 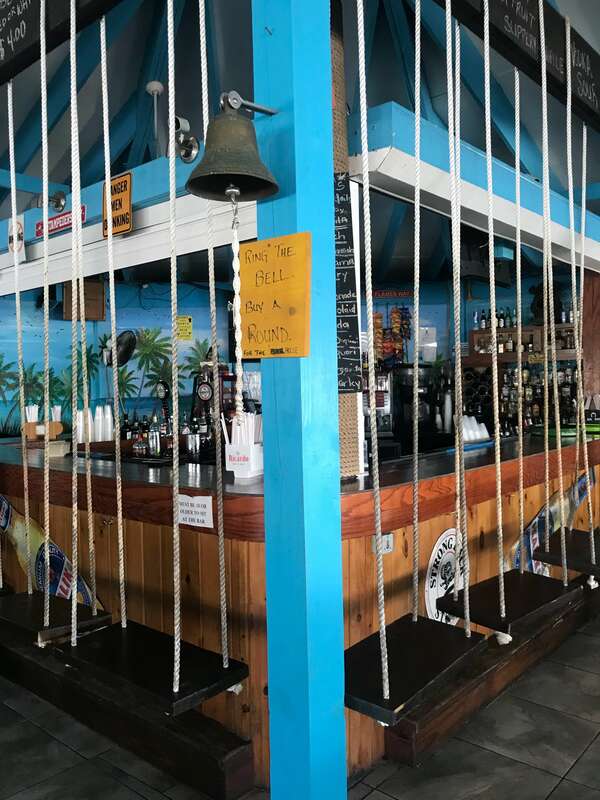 Splash Restaurant at the Hideaways at Palm Bay had one of my favourite things – swings! I swear when a restaurant has indoor swings like this it’s not possible to have a bad time! The restaurant had a fun style of decor, and our breakfasts had such hearty portions it was difficult to finish! La Fourchette at Rocker’s Point was a tiny little French Restaurant located on the beach with one of the most incredible sunsets we witnessed on our trip! After all of the seafood I was eating I decided it was time for a steak! It turns out huge portions are easy to come by in Great Exuma so I could barley finish my meal. At Santanna’s I had to try the deep fried lobster. THE BEST LOBSTER I’VE EVER HAD. And I’ve been to the East Coast where it’s supposed to be the best – this was better! There is no way I would go back to that side of the world without making a stop back here again – the food was out of this world! 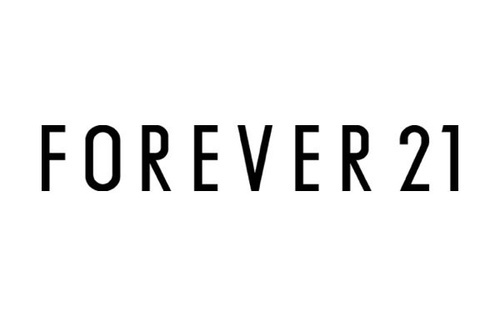 In short, absolutely! Throughout my trip I often thought about how much my son would just love everything I was experiencing on the island. 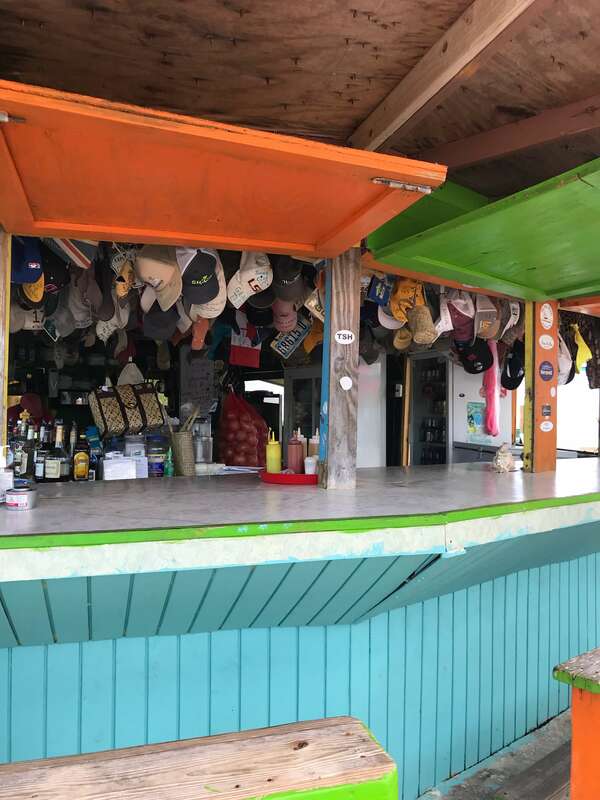 The Grand Isle Resort & Spa offers all kinds of kids activities (aged 5-12) at the Hummingbird Hut including treasure hunts, horseshoes, kayaking, stand-up paddle boarding, and boogie boarding! There are Hummingbird Hut team members at the resort from 10am – 3pm each day that lead all of these adventures for the kids. Emerald Reef Golf Club adjacent to the resort even offers parent and child golf lessons, so there are some fun experiences for kids at the resort we stayed at. 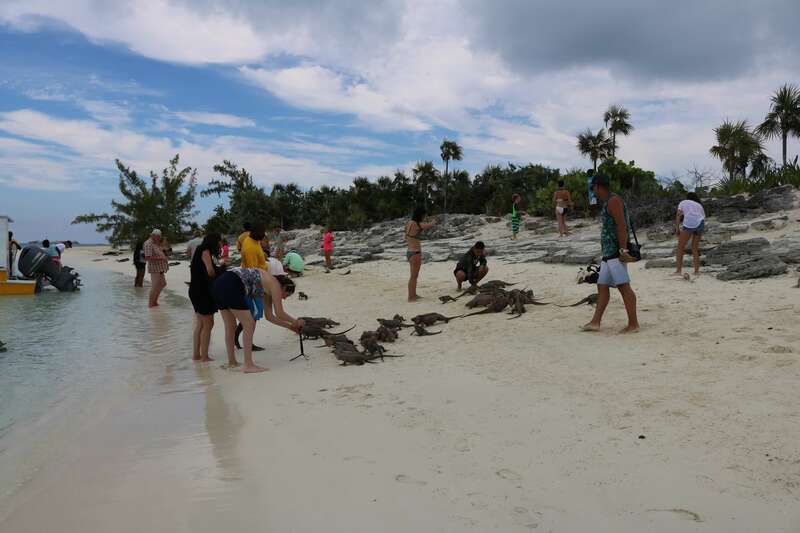 Each of the activities we took part in during the course of our trip including swimming with the pigs, petting the stingrays, swimming with the sharks, and visiting the iguana’s were all adventures children could enjoy. The child I saw swimming out of Thunderball Grotto was no older than 5! I can’t think of a thing we did during this trip that I child couldn’t do, or wouldn’t love. 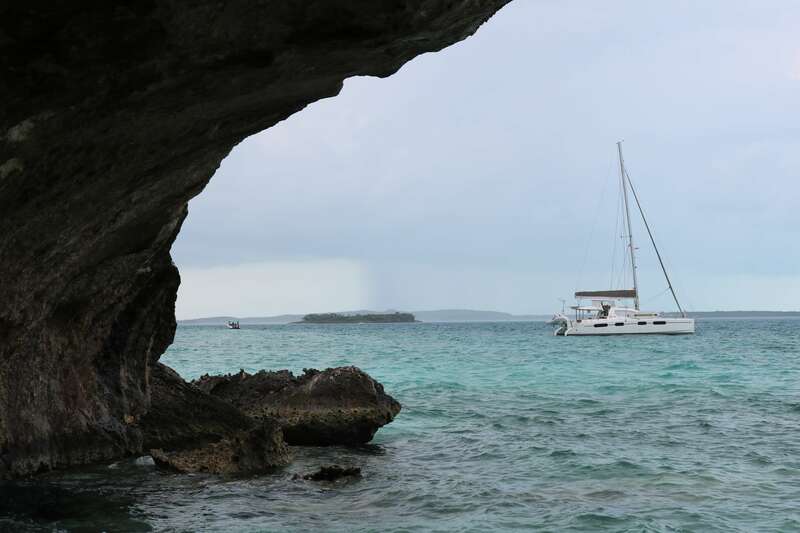 When I bring my own son back to Great Exuma I would absolutely sign us up for another charter with 4 C’s Adventures – they put together an amazing tour and took great care of us. Final thoughts on my trip? It was one of those once-in-a-lifetime trips that I need to repeat. I can’t wait to have my son and husband experience the things I was able to see and do while I was in The Exumas. 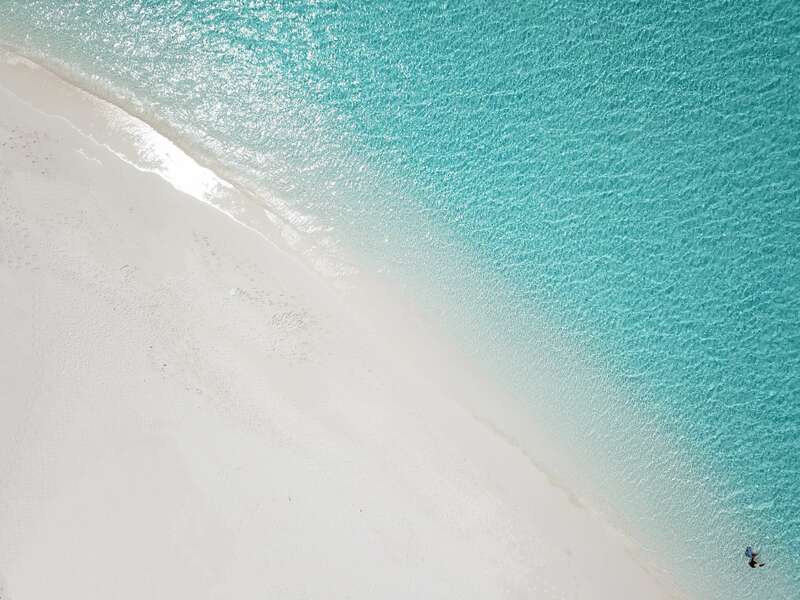 With Great Exuma being such a short flight away with Air Canada’s direct flight from Toronto there’s no excuse to miss this amazing group of islands. Thank you again to Air Canada Vacations and the Bahamas Ministry of Tourism for allowing me to be a part of this trip! It was an incredible experience, and I couldn’t wait to share everything they arranged for us. 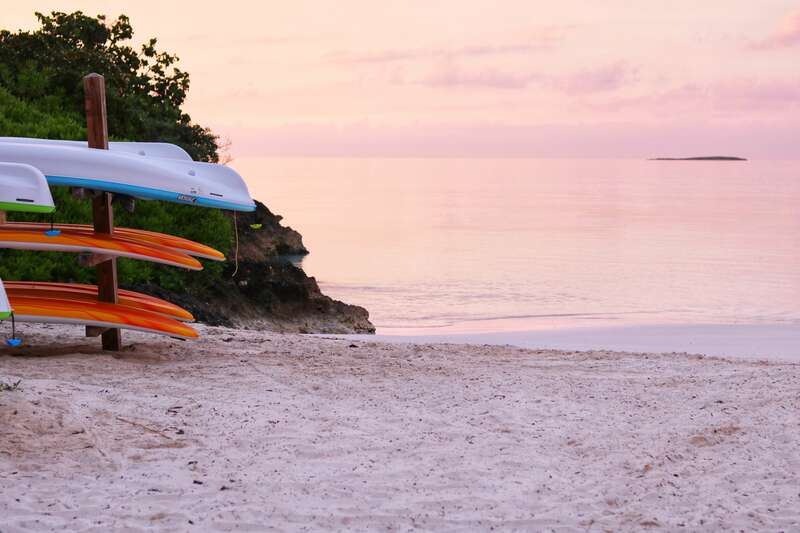 Some very exciting news – use Promo Code BAHAMAS102 at checkout on AirCanadaVacations.com to save $102 per booking. 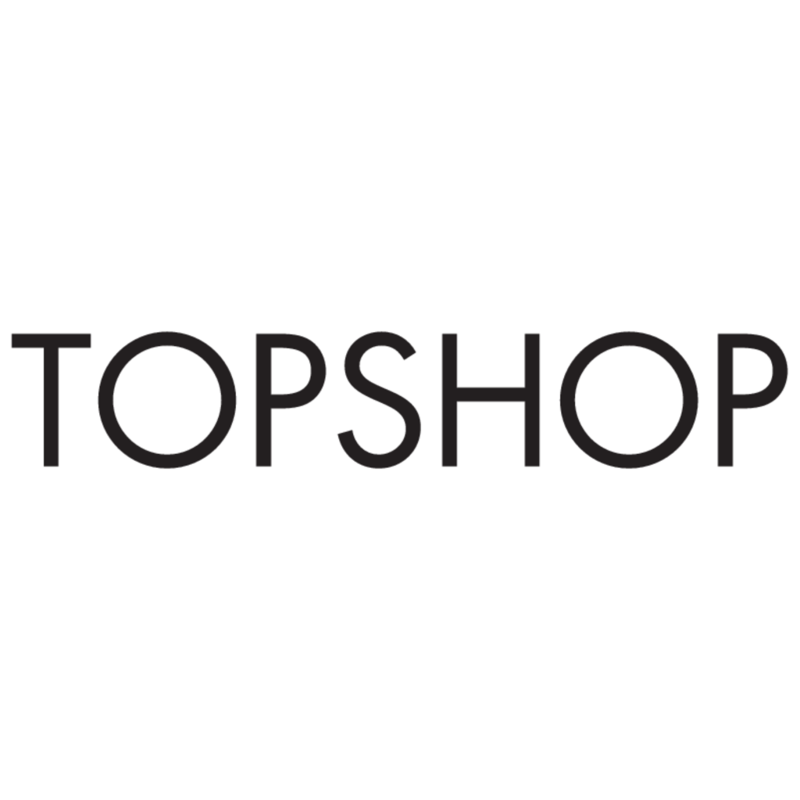 The Promo Code is valid until July 31, but for travel from July 1 – April 30, 2019! 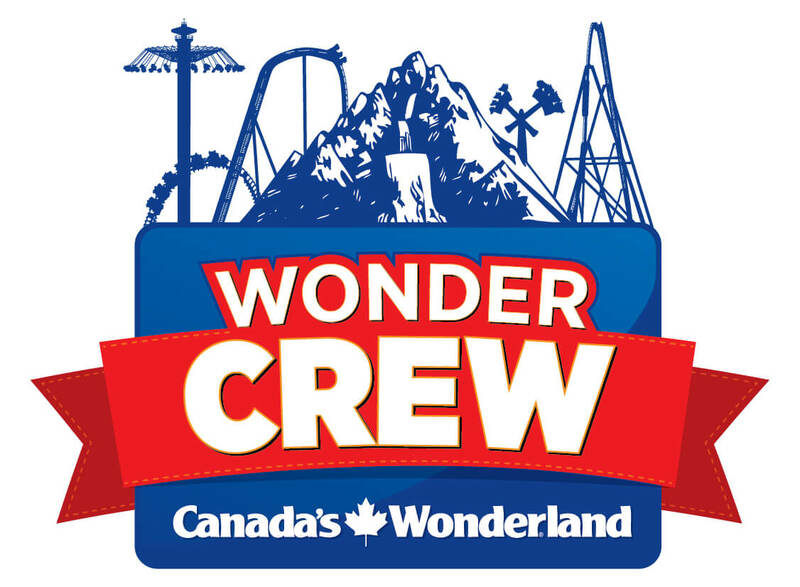 Here is the fine print: Promo code is valid on bookings made online only between June 7 and July 31, 2018 11:59 p.m. 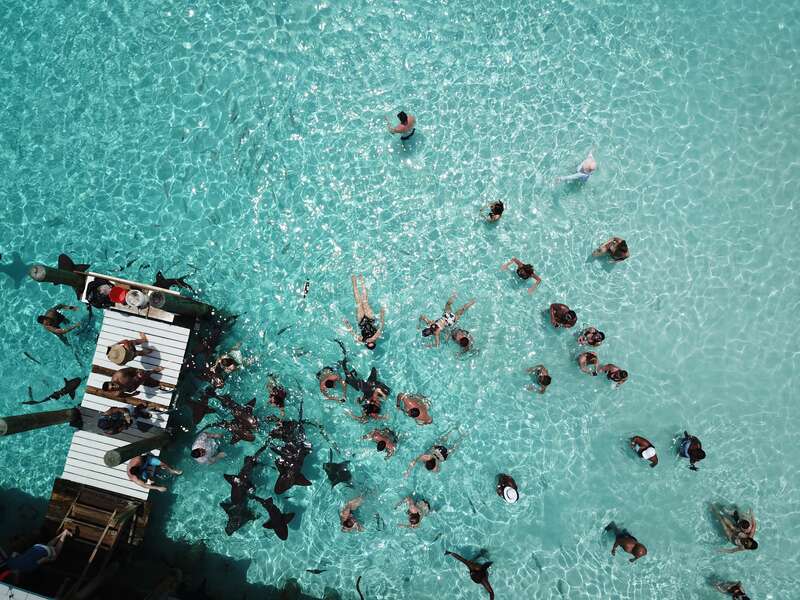 ET, for travel between July 1, 2018 and April 30, 2019, for Flight and Hotel packages to Bahamas. Value of $102 per booking. Promo code BAHAMAS102 must be applied online at aircanadavacations.com for the discount to be applied. Not applicable to group bookings. Offer not combinable with other promo codes, and is not combinable with other discounted packages. Offer expires at 11:59 p.m. ET on the date indicated. 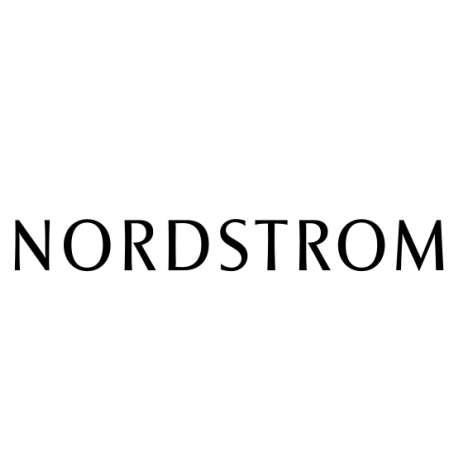 Your promotion code may not be distributed or sold, or otherwise used for commercial or personal gain, other than for the purpose for which it is intended. Air Canada reserves the right to modify or cancel this promotion code at our discretion. Any violation of these conditions may be subject to cancellation of any booking made using this promotion code, and/or to any legal or other recourse available for the recovery of damages suffered or costs, expenses or loss incurred as a result of such prohibited use. 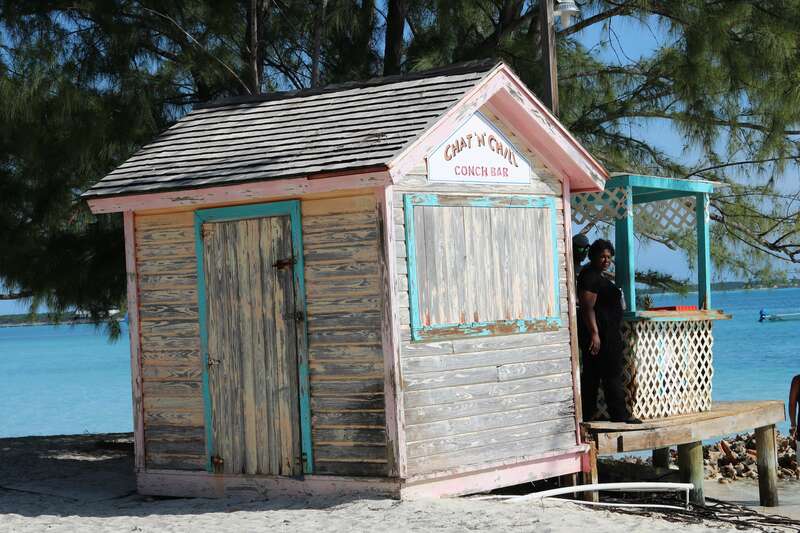 I have another post coming soon on my adventure in Nassau – stay tuned to the blog for my next video and blog post!